Six hundred years ago, Wenceslas Square was a horse market established by Charles IV. Today the only horse you will see is the statue in the center of the street carrying the legendary good King Wenceslas. When the Czech lands are in peril, the people gather around this mighty statue and await the return of their savior. When the Czech people are at their darkest period, when they need help the most, when the enemy is about to strike the final blow, the statue of good King Wenceslas will come to life. A long, long time ago in Prague, there lived a young man named Bruncvik. He was at the age that requires adventure, a need to travel new lands and to prove his worth. A young maiden, Neomenia, who loved him very much, begged him not to leave. But he had to go—his blood was too hot to stay. He promised her he would return within seven years and marry her. With a final look into her tear-filled eyes, Bruncvik turned and set off to see the world. Prague was at his back; ahead lay the unknown. And adventures he had. At sea, his boat was overtaken by a fierce storm. The boat and its crew were tossed onto the dreaded Amber Island, a place from which no one had ever returned. Two long and agonizing years passed with no hope of escape. All the men from the boat except Bruncvik died on the island. Their loss of hope drained all life out of them. Only Bruncvik had a reason to continue to live—his beloved future wife kept his heart pumping. On the island were left only Bruncvik and an old man marooned on the island decades before. Bruncvik begged the man to help him off the island. The old man, seeing passion in the young man’s eyes, revealed a secret: Every year a large bird flies over the island looking for prey. Bruncvik covered himself in horse’s skin and sat waiting atop the biggest hill on the island. Sure enough, the large bird came, picked him up in her sharp claws, and took him off the island. Bruncvik was dropped in a nest amongst three baby birds. The hungry birds began eating away at the horse’s skin. Bruncvik, free of the disguise, pulled out his sword, killed the baby birds, and jumped out of the nest. He walked the lands until he came across a large lion fighting a multi-headed monster. Seeing that the lion was losing and tired, Bruncvik joined in the fight. After many days of fighting together with the lion, the monster was defeated. The lion and Bruncvik quickly became friends—fighting friends. They traveled the lands fighting monsters together. During one strange adventure, where the queen of the lands tried to force Bruncvik to marry her, not only did he manage to avoid marriage, but he also managed to steal a magic sword. The sword had the special power of chopping off heads with a simple verbal command: “Blade, heads off”. This magic sword made Bruncvik a great warrior. After many years of rolling the heads of his enemies, Bruncvik’s blood began to cool. He wanted to return to his love and future wife. He headed home with his loyal lion. His adventures did not end upon his return. He discovered that Neomenia, who had waited for more than seven years, was to be married the next day. She could not wait for her true love any longer. But when she discovered that he had returned, she quickly called off the wedding and pledged her soul to the returning hero. Jealousy and rage took over the rejected husband-to-be. He rounded up his friends and plotted to kill Bruncvik. They surrounded him and attacked. But Bruncvik was a master fighter, and with his magic sword he separated them all from their heads. Like all good legends, Bruncvik and the lovely Neomenia married and lived a long and happy life together, their pet lion always at their side. The magic sword is hidden somewhere amongst the stones of Charles Bridge where it waits to this very day until it is needed again. Only one man knows the true hiding spot—King Wenceslas. A day will come when Prague will be in its darkest hour. When all seems lost. When the enemy will be hours from defeating the Czech people. When this day comes the Czech people with gather at the statue of Saint Wenceslas. The stone of the Statue will burn away and from the ashes will emerge King Wenceslas. Sitting strong and firm on his horse he will comfort the Czech people with his cry, “Sleeping Army of Blaník, rise from your slumber!” Thunderous noise will be heard as the long sleeping army rises from the mountain and heads towards Prague – towards their Good master. King Wenceslas will gallop to Charles Bridge and knock over a secret stone - the location of the magic sword will be revealed. Sword in hand and a blood thirsty army at his command Wenceslas will defeat the enemy. The skies will clear. The motherland and its people will be saved from evil and returned to peace and prosperity. In 1945 the people of Prague revolted against the Nazi's. The Nazi's fought back and attacked Prague. Wenceslas Square was covered in smoke and fire as the battle raged. It was a dark period but not the darkest. King Wenceslas did not rise. And rightly so, the Nazi's were defeated and the Czech people released from the tight grasp of the enemy. But as soon as the grip of Germany was released, a new iron grasp began to tighten around the Czech people. The Russians. In 1968 tanks rolled down the square with their tanks and forced the Czech people into submission. King Wenceslas did not rise. The motherland was darkened by the blanket of communism. For the next eleven years the stone-faced King Wenceslas waited at the top of the square watching over his people. It was not yet his time. The people were left to defeat this enemy on their own. In 1989 the people did revolt and gather at the statue of Wenceslas. 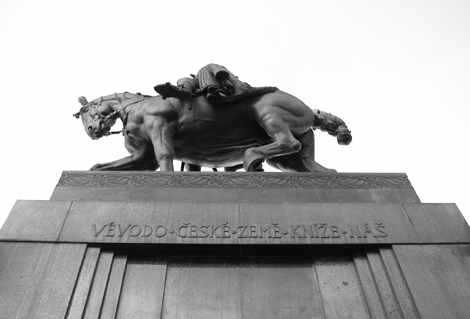 With the statue at their side the Czech people tore of their chains and freed themselves. The Russians left the land and Czech's became free once again. 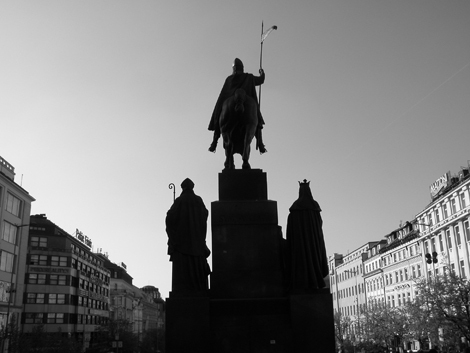 The Good King Wenceslas still stands at the square waiting to awake and save his people. First of all, Wenceslas Square is not a square; it is a rectangle about 750 meters long and 60 meters wide. The long sides of the rectangle are lined with tall buildings. The bottom floors are shops and stores. I have no idea what are on the upper floors. Wenceslas Square is another one of those Prague sites that you must visit. 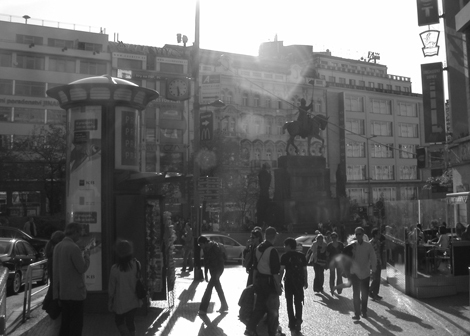 If you return home and you are asked, “What did you think of Wenceslas Square?” and your reply is, “I did not go there? What is that?”, the response will be an bended eyebrow, “What?, you went all the way to Prague and did not go to Wenceslas Square?”. The first time I went there was to look for jeans. The square has many big brand name shops like BATA, H&M, Marks and Spencer and C&A. If you need to do some practical clothes shopping you will find what you are looking for in the square. The square is a crossroads for almost anywhere you want to go in Prague, so I end up walking through it a lot. But, there is not much to do there except shop. Along the whole street are little shops called 'Traffikas'. There you can buy cigarettes, beer, magazines and snacks. When you see the workers in these little boxes ask yourself, 'How do they get in and out of there?' They stand inside these Traffikas and there is only room for them. And they are surrounded by their product. The first time I saw it I assumed that they were lowered in from above. But that is not how they do it. You will have to wait around a bit too see how it is done. Buy a beer from them, sit down on a bench and wait to see how a turtle leaves its shell. Also on the street are what I can describe as large hot dog stands. They sell Czech-style sausages with mustard and bread. A classic meal for the tourist on the run. They also have other Czech foods like schnitzel and bramborak (potato pancakes). But much like hot dogs from a hot dog stand, the food is not top notch. It is too greasy for my liking – everything is dripping and fried in grease. But after a long night's drinking it might be exactly what you need. It is right above the Museum metro station. When you are waiting for your friend you can sit at the benches around the statue. Looking up the square you see the grand Czech National Museum. Looking down the square you see the entire square with all the people moving about - a great people watching place. There is a McDonald's right across the street. If the most dire and darkest day in Prague happens to be on the day you are waiting for your friend, you will be very close to the resurrected Good King Wenceslas – absolutely the safest place to be.